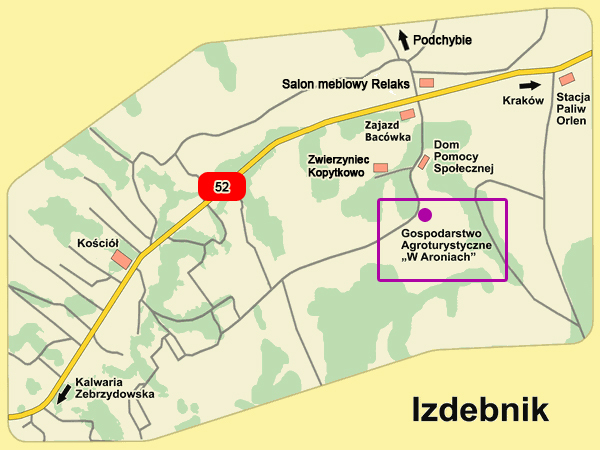 Our agritourism farm is located by the main road from Krakow to Bielsko-Biala, 7 km West from the highway to Zakopane (Zakopianka), on the "Pope's Jean Paul II" touristic route to Wadowice, birthplace of Karol Wojtyla. * Coming from Krakow to Izdebnik, you will pass by the Orlen gas station on your left, then continue straight about 800 m. Turn to the left from the main road, by the wooden roadhouse bar "Bacowka" (there is a small crossroad). Continue 500 up on the small road through the forest and having a big wall on your left. You will see our farmhouse on the hill. * Coming from Wadowice, pass by the center of the village (traffic lights and the church on your left). After 1700 m turn to the right, where you will see the roadhouse bar "Bacowka". Continue 500 m up to the hill, where you will see our farmhouse. GPS: N 49* 52' 14" , E 19* 46' 59"